A crawler crane boom came down onto a barge from which another crane was working yesterday in West Palm Beach Florida. The crane, a classic Manitowoc crawler - possibly a 4100 - was one of three large crawler cranes working on the Flagler Memorial Bridge replacement over the Inter Coastal waterway, and appears to have been extracting sheet piles. The crane which has come down is owned by Barcelona Equipment and was working on a jack up barge at the time. 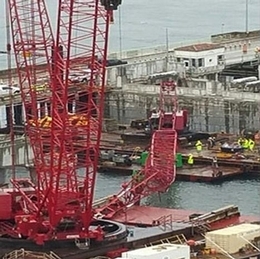 The boom tip landed on another barge from which a larger Manitowoc Ringer owned by Essex Crane Rental was working. We have no information on what caused the boom to drop although it was suggested by a local correspondent that the failure of a boom hoist cable or pendant might be to blame. Thankfully no one was hurt in the incident and the boom appears to have fallen short of the larger crane.